Falling in love with your boss is never a good idea. And if you’re a lesbian and she’s straight – that’s double trouble right there. When Kim and her very attractive, straight, and married boss Sonja find themselves having to share a hotel room at an out-of-town conference, one thing leads to another. But after one night of forbidden passion Sonja almost cruelly tells Kim they’re finished. Sonja’s emotional and physical distance is a torment to Kim. And aside from the obsessiveness of being in love, there are more questions: What is really going on in Sonja’s marriage? Is Sonja who Kim really thinks she is, after all? And – what are the chances that love will prevail? 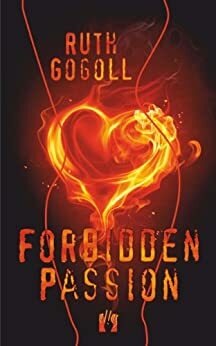 Reading Forbidden Passion I felt the characters come alive. I understood their situations and the feelings of liking someone you shouldn't all too well, of dealing with inappropriate feelings and desperately trying to channel them into something else entirely, something more productive and feasible. ("It was endless...and hellish," one woman thinks as she longs for someone who is emotionally and logistically out of reach.) Yearning for the impossible and having it somehow happen (eventually) is often a favorite theme of mine, especially in romantic fiction. But everything here that makes this a gripping read also makes it a frustrating one: two completely different people connect unexpectedly and then spend the rest of the novel coming together and separating, coming together and separating, the one woman totally committed to understanding and accepting how aloof, and even cold-hearted, the other woman (the love of her life) is, both of them often behaving in a way that makes you want to yell a little. We suffer for love, surely, and many of us would do most anything to get and keep it. Yet I found the dynamics between Kim and Sonja often very exhausting. Not a lot of people would put up with the nonsense Kim does. She's either a fool or exactly the kind of person you'd want to be in a relationship with. Crisp yet heartfelt writing, great dialogue and fully fleshed out characters keep what should have been a ludicrous plot a very compelling one. Another selling point for me is the uncomfortably realistic attitude that desperately trying not to acknowledge how you feel about someone can be a twenty-four hour a day job. In a way the very things that made me uncomfortable with Forbidden Passions were the things that kept me reading. 5.0 out of 5 starsWhat? Reviews are forbidden? I cannot believe that this book is #1 on Hot New Releases and no one has reviewed it as yet! I found it to be a very good read. At almost 350 pages and $9.99 price it is not over priced. The story is a little long but, hey, there is a lot to tell! You can pick up the plot line from the author's preview, but oh what a tale she weaves in the unexpected and the surprises. Enjoy!! I thought this was a pretty good read. It kept me guessing throughout. The story was anything but dull. I even re-read it for fun.